Computers are like magnets for dirt. 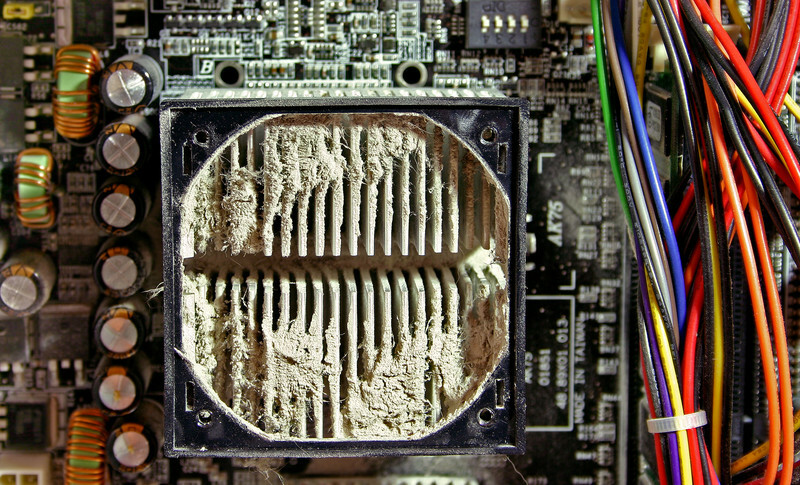 We regularly see computers where fans are just clogged with dust and someone has eaten their lunch on the keyboard. Whenever your computer is serviced the engineer will use a compressor to blow all the dust out of all the nooks and crannies to ensure your computer doesn't get clogged with dust. Dusk can block the air-vents which can cause overheating. Overheating is one of the most common causes of component failure. If you prefer to clean it yourself the easiest way is to purchase a can on compressed air from a local computer retailer. Bacteria can build up on the keyboard and other parts regularly handled. Do not spray the computer directly. Instead you can put some general cleaning spray onto a cloth (I recommend microfiber) and gently clean the outside of the device. For the keyboard a cotton bud dipped in an alcohol based cleaner (damp not dripping) works a treat. Use monitor cleaner and a microfiber cloth to clean the screen. if you do not have monitor cleaner just dampen the cloth with pure water. Always try and provide a clean environment for your computer. If it must be kept in the wool shed put something over it when it is not in use and give it regular cleans.